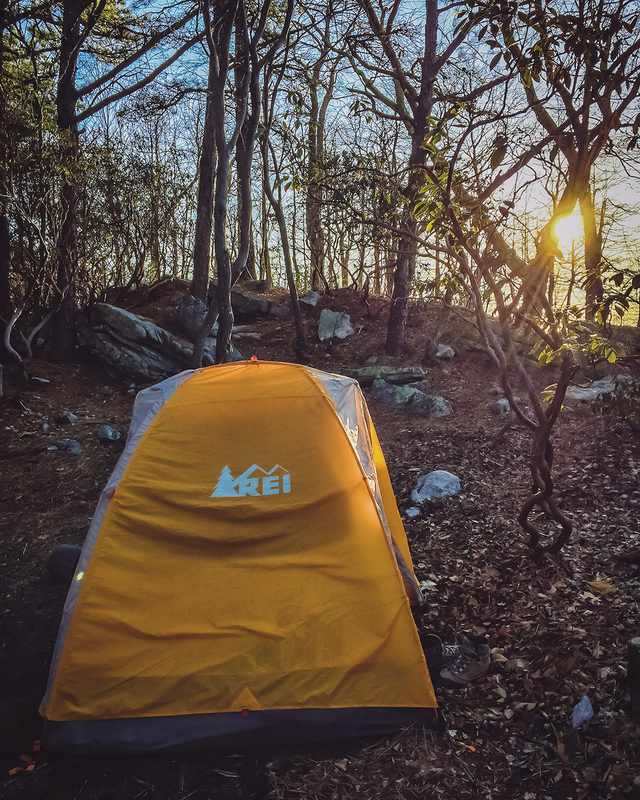 Last weekend we visited the George Washington National Forest to hike Tibbet Knob, a gentle 3-mile moderate trail running on the West Virginia border. Views at the top are amazing and there are several campsites for those who want to stay overnight and enjoy all this area has to offer. We were in our way to go camping in the New River Gorge - also in West Virginia, but the trip was much longer and the traffic was so bad that we decided to change our itinerary. We arrived at the Wolf Gap Recreation Area on a sunny and cold Friday afternoon and started the 1.5-mile hike to the top. The forest soaked in the spring evening sunlight, displaying the beautiful green colors of the moss along the side of the trail. The hike is steep at some parts, but it's short enough to not make you feel discouraged. At the top we found two camping spots, one of them very close to the overlook. It has room for 2 - 3 tents and is well protected from the wind. We decided to spend the night there despite the cold temperatures - around the 40s. There we found another camper reading a book in his tent. We tried to watch the sunset over the mountains from the overlook 10 meters away from the campsite, but the cold wind prevented us for staying more than a minute. Tired as we were, we just run inside our tent without even having dinner, wearing as many layers as possible. We heard how the other camper started to make fire, and we couldn't figure out how he could be outside by himself with such severe, cold and noisy wind. We woke up before sunrise with the loud sound of two early birds. We prepared breakfast - tea included - and headed to the overlook to see the morning light flowing over the Appalachian mountains. The scenery was gorgeous! Our intention was to hike and explore the surroundings, but our joints were too cold and stiff in the morning, so we gave up. We ended up sunbathing and having a nap near the tent. Spending time in nature makes you feel better emotionally, changing from depressed, stressed, and anxious to more calm and balanced. You have plenty of time to relax, enjoy and explore little things life has to offer. Read more here. After a short nap he went to explore the wildlife and the rocks around the summit, while she stayed resting at the campsite - due to her recent shoulder surgery. 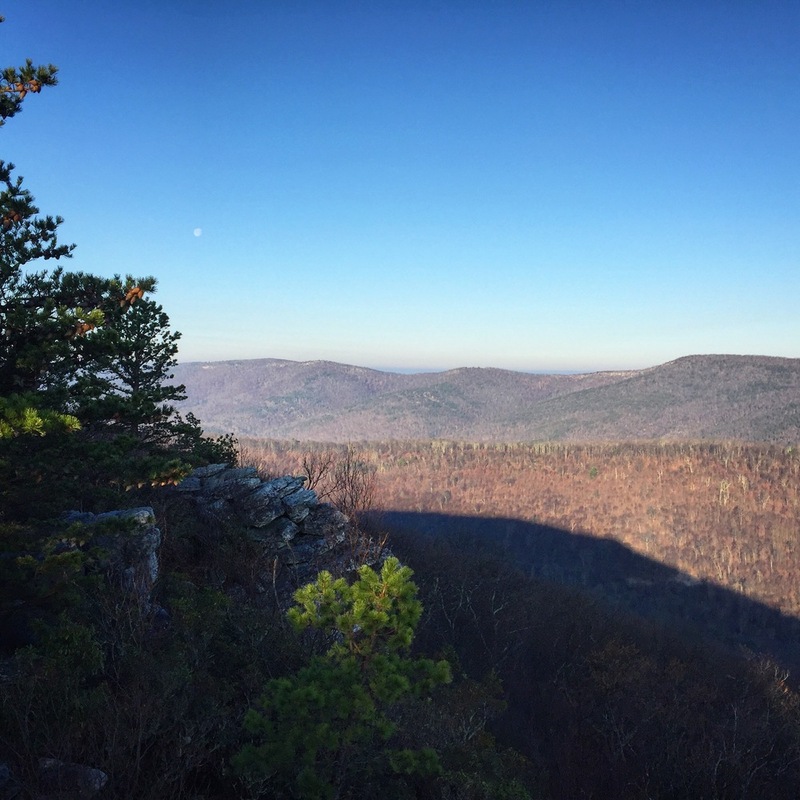 All he found was butterflies, birds, communities of small green plants, some interesting frozen fallen leaves, and the moon over the Ridge-and-Valley Appalachians. 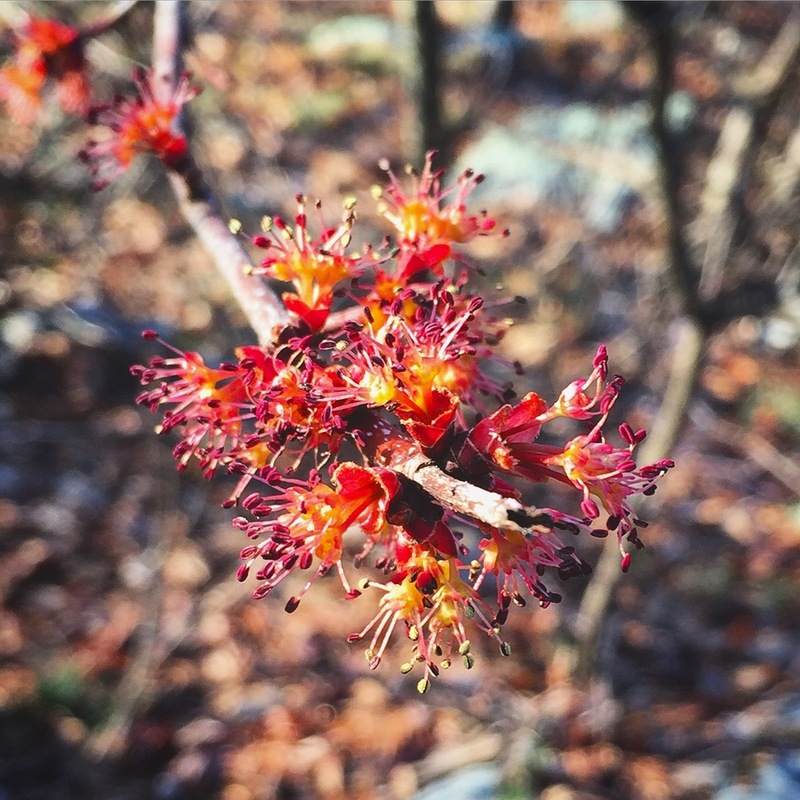 Red maple tree blossoms can also be found at this time of the year (early spring). 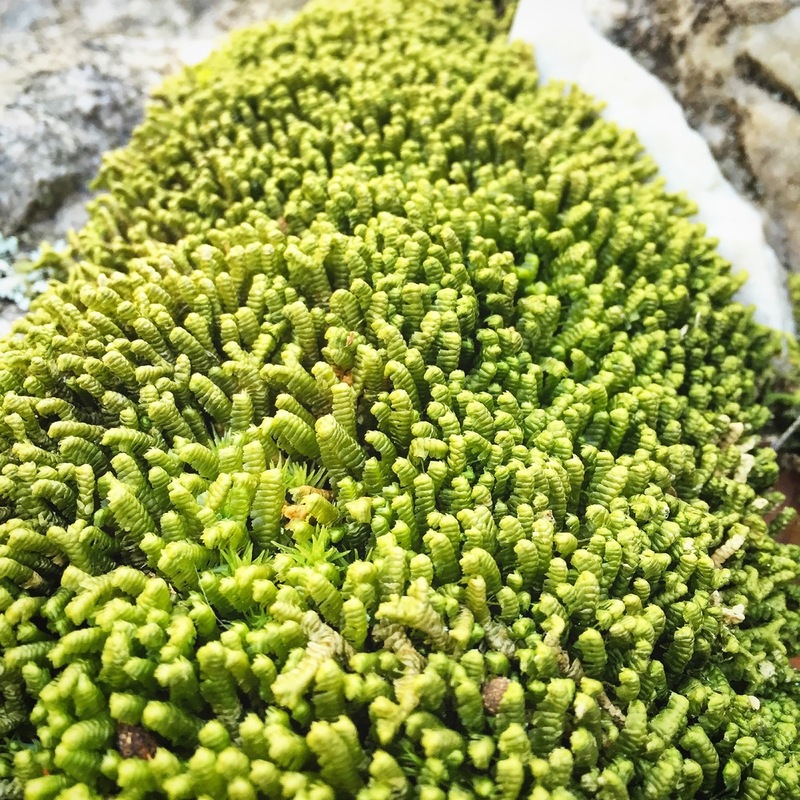 The mass flowering occurs before the trees' leaves emerge, so that pollen can ride through the woods on chill winds with minimal interference. Wise trees! The cliffs at the overlook are tall enough to try some top rope climbing, and the piles of quartzite rock formations at the trail are worth for some rough bouldering. In the afternoon we began our hike down after a last moment at the overlook, feeling even more connected to each other and the larger world, happier and full of good memories.